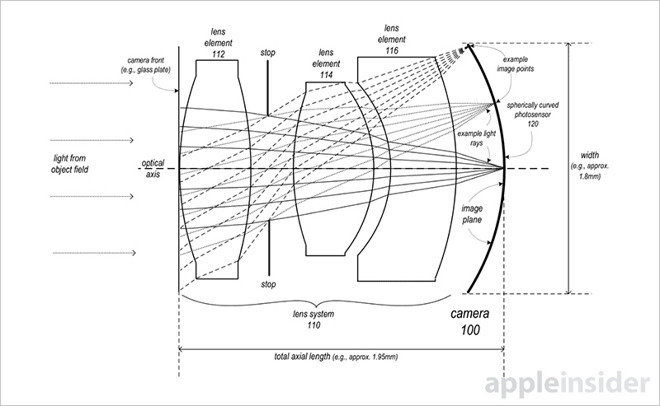 In its quest for high-performing, flexible and —most importantly —small imaging systems, Apple on Tuesday was granted a patent for a spherical photosensor and lens array that provides high-resolution capture in an incredibly compact package. As published by the U.S. Patent and Trademark Office, Apple's U.S. Patent No. 9,244,253 for a "Small form factor high-resolution camera" marries cutting edge sensor technology with similarly complex optics to create a compact, high-performance digital shooter suitable for deployment in iPhone and iPad. 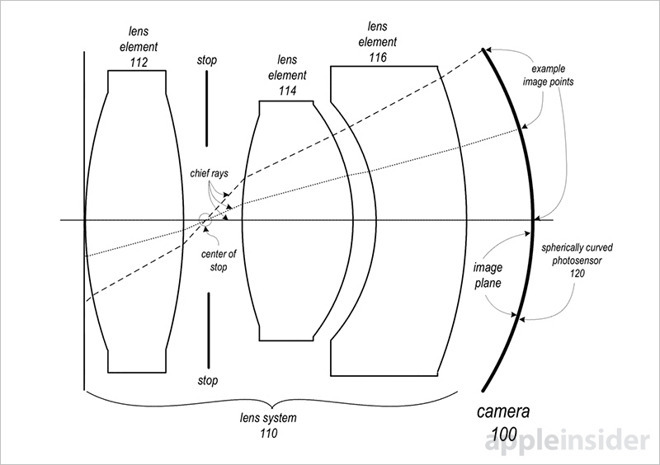 In some embodiments Apple describes a photosensor that is spherically curved to receive incoming light, refracted through specially crafted lenses, onto a concave surface. An apt analogy would be a bowl filled with water; the bowl represents a spherically curved image sensor and the water a fitted lens system. To correct for diffraction and visual aberrations that propagate within miniature cameras, the proposed lens system includes three lenses, two of which are convex or substantially convex. A third meniscus lens, or a lens with opposing convex and concave surfaces, is situated between the first two lens elements and the spherical photosensor. The meniscus lens' concave surface faces the first two lens elements, and thus incoming light rays, while the convex surface interfaces with the sensor, focusing light onto the sensing surface. The setup does come with a few drawbacks, however, the most prominent being native barrel distortion, or a bubble-like warping. Apple proposes a software solution for correcting such unwanted effects, which can appear in varying degrees of severity depending on focal length, aperture and other system settings. It is unclear if Apple intends to apply its curved photosensor patent in future iPhones, as the company has long relied on Sony's stellar backside-illuminated modules for its imaging needs. The technology could, however, delay the inevitable as Apple races to cram more components into an ever-shrinking device lineup. 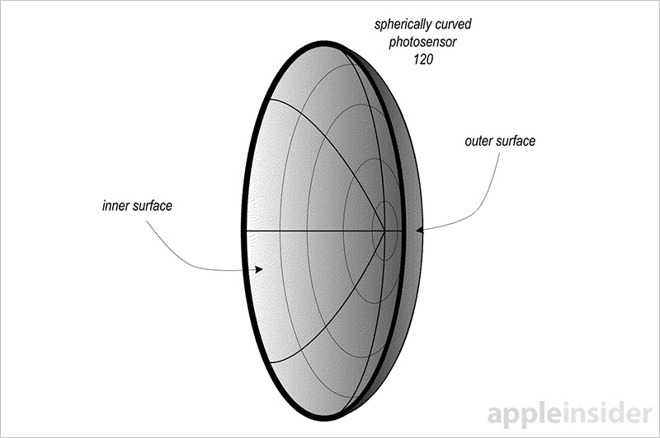 Apple's curved spherical photosensor patent was first filed for in 2013 and credits Xi Chen, David S. Gere and Matthew C. Waldon as its inventors.